Intro to Lindy Hop will take you through some of the basics of solo and partner dancing as well as some sweet moves and turns that you’ll love! We’ll dance to a variety of vintage and contemporary music and even learn a choreography we can perform at the end of the semester! Evin Galang started teaching Vintage dance in Chicago almost 20 years ago. Teaching nationally and internationally, she has introduced thousands of people to the pure, unbridled joy of partner dancing! 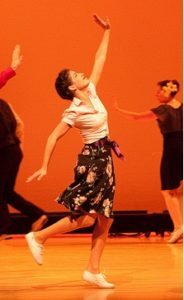 Embracing both the rebellious nature of what Lindy Hop represented back in the 1920s and 30s, as well as the modern approach to refined techniques, Evin is able to teach to a variety of learning styles and guarantees you’ll have fun! Join the mailing list to receive the monthly eNewsletter. The New School admits students of any race, color, national, and ethnic origin, or sexual orientation to all the rights, privileges, programs, and activities generally accorded or made available to students at the school. The New School does not and will not discriminate on the basis of race, color, national, and ethnic origin in administration of its educational policies, admissions policies, scholarship and loan programs, and athletic and other school-administered programs. Join our mailing list to receive the latest news and updates from the school.